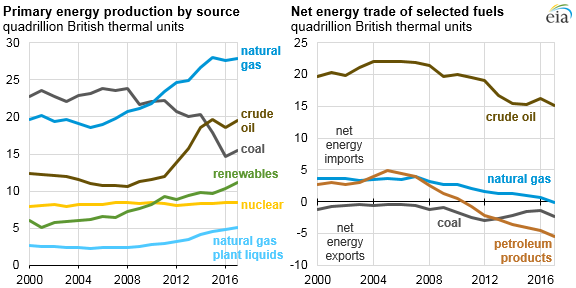 Total net energy imports to the United States fell to 7.3 quadrillion British thermal units (quads) in 2017, a 35% decrease from 2016 and the lowest level since 1982, when both gross imports and gross exports were much lower. 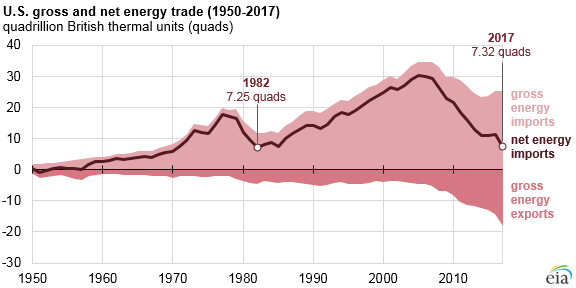 Gross energy imports have been generally decreasing from a high of 34.7 quads in 2007; however, the larger factor leading to the reduction in the net energy trade balance has been increasing energy exports. Gross energy exports rose to 18.0 quadrillion Btu in 2017, a 27% increase from 2016 and the highest annual U.S. energy exports on record. Increasing U.S. energy exports have been driven largely by increases in exports of petroleum products and natural gas. In recent years, exports of crude oil have also contributed to the overall rise in energy exports after crude oil export restrictions were lifted at the end of 2015. In energy content terms, the United States now exports nearly as much energy in the form of crude oil (2.3 quads) as coal (2.5 quads). In 2017, the United States saw substantial increases in exports of all fossil fuels, with exports of crude oil (89% higher than in 2016), petroleum products (11% higher), natural gas (36% higher), and coal (61% higher) all increasing over the prior year. Exports of crude oil and petroleum products both reached record levels. 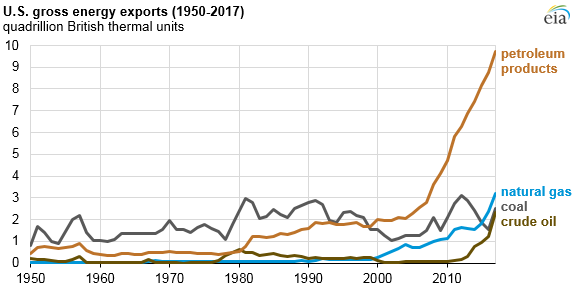 Petroleum products such as gasoline, distillate fuel, propane, and other fuels currently make up the largest share (54%) of U.S. energy exports. Note: Other energy exports represent less than 2% of total. The United States became a net exporter of petroleum products in 2011 and natural gas in 2017. In 2017, the United States was a net exporter of coal, coal coke, petroleum products, natural gas, and biomass, but a net importer of crude oil. Net electricity trade with Mexico and Canada was relatively minimal. An increase in total U.S. energy production contributed to the decline in net imports in 2017, led by production increases in renewable energy (8%), especially hydropower and wind, as well as production increases in coal (6%), natural gas plant liquids (6%), crude oil (5%), and natural gas (1%). Total U.S. energy consumption was virtually unchanged from the previous year’s level.